From fine Californian wine to urban craft beer, the USA is the cradle of some of the most exciting modern day beverages that you will ever taste. 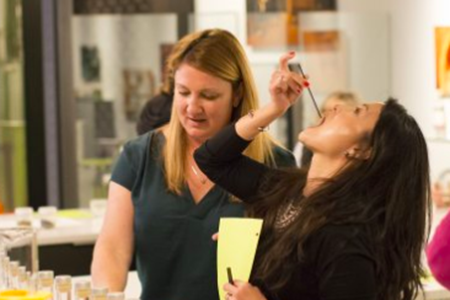 Delight your senses by taking a wine and craft beer themed journey through the states, learning about the history and culture behind beverage making in the USA. Prohibition will definitely be over for you! 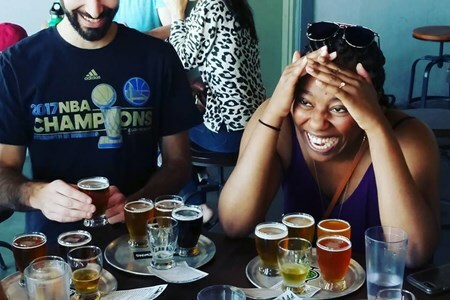 The Golden West Beer Tour | Visit Oakland and Berkeley Breweries There's nothing better than a guided tour where you check out the best local breweries, drink amazing beers, meet great ... morepeople and not have to worry about a thing! Oakland was at one time one of the largest beer brewing cities in the country until Prohibition ended the city’s golden glow. But thanks to several microbrewers it is buzzing again. For the last few years Oakland and Berkeley have emerged as a craft beer goldmine and the location of some of the best breweries, brewpubs and beer bars in the Golden State. On this brewery tour you can also listen to your favorite tunes and play games throughout the day! 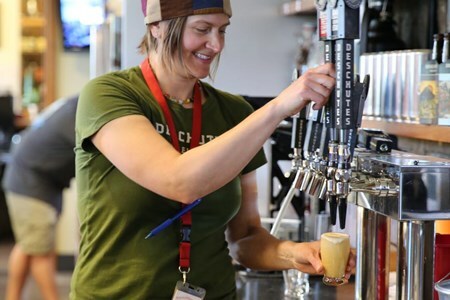 You will have plenty of time to taste a variety of amazing beers from Common Lagers to Sours and enjoy a quick bite if you choose. 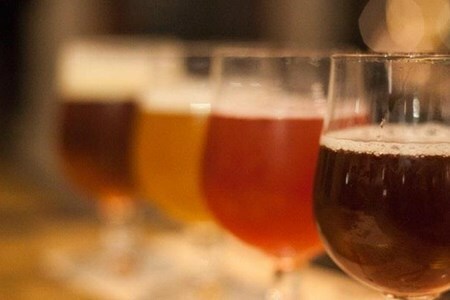 The Blue Collar Beer Tour | Visit Breweries in Alameda and San Leandro, California There's nothing better than a guided tour where you can check out local breweries, drink amazing ... morebeers, meet great people and not have to worry about a thing! On this beer tour you will visit breweries on the industrial side of San Leandro as well as visit Alameda to taste innovative beers and learn about the brewing process. Sip and relax while enjoying amazing views of the bay and ride through some beautiful neighborhoods. You can also listen to your favorite tunes and play games throughout the day! Reservations are required. All participants must be at least 21 years old. Snowshoeing and wine tasting in mountains of Leavenworth, Washington is the ultimate winter wonderland adventure! 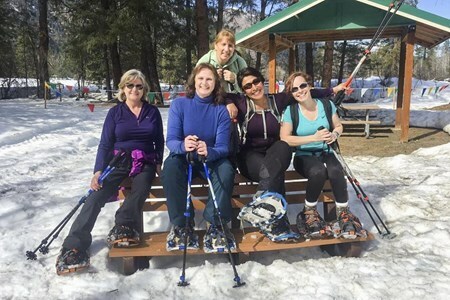 Meet your group in downtown Leavenworth, Washington and you will ... morethen be transported by our adventure bus to and from our beautiful snowshoeing area along the Icicle River. You will love trekking with your experienced and outgoing guides as your snowshoeing trek leds you through several miles of Alpine Meadows and Ponderosa Forests. Be sure to bring your camera as the scenery is absolutely breathtaking (Hint! your friends will be so jealous when they see your pictures). Behind Adobe Walls Fragrant Wysteria vines cascading over an adobe wall, a hand carved rustic door leading to a secret courtyard....plastered adobe walls mixed with mica or straw glistening ... morein the sun ... Join us on an exclusive and charming tour of 'Behind Adobe Walls' an architectural and interior walking tour in the historic Eastside neighborhood of Santa Fe. Discover the beauty and distinguishing features of the three styles of architecture found in New Mexico; Pueblo, Spanish Territorial and Northern New Mexico architecture. Walking down small, winding back roads in the residential historic district intertwined with Canyon Road's Gallery district you will discover the traditional warmth of New Mexican Pueblo style, the classic elegance of a Spanish Territorial and the tall and narrow pitched roofs of Northern New Mexico style. As we walk along the traditional Acequia (water ditches) in the historic district, learn about their history, and how they continue to be used today to irrigate private residences gardens through a time-old tradition of controlling the opening and closing of the water flow. By the end of the walking tour you will be in tune with the architectural character and history of each style. 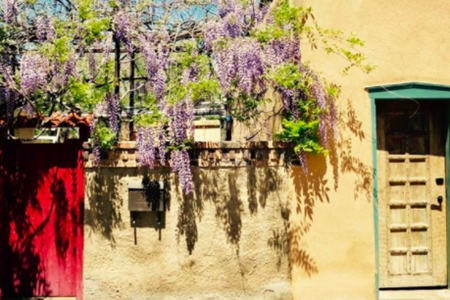 What makes the historic homes in Santa Fe feel so charming, grounded, soulful and blessed with sanctuary? Elements of hand-craftsmanship by local artisans; tinwork, wood carved architectural details, hand-plastered surfaces, textiles, antiques with patina and found curiosities. Cool off with a refreshment of prickly pear cactus ice tea or "Cota" Indian tea along with homemade biscochitos in the traditional inner courtyard. 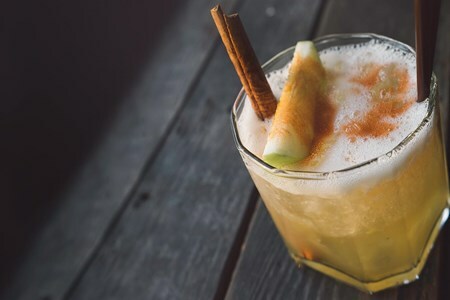 Learn how easy it is to prepare these traditional and elegant Santa Fe refreshments for your guests when you get back home using simple ingredients you can purchase in Santa Fe. This Friday Night Bend Bike Pub Crawl starts at 6 pm at a historic Inn in downtown Bend, Oregon. From there the group will visit 3 to 4 different Brew Pubs to taste local beers. In ... morebetween pubs there will be a historic tour of the Old Mill District and the waterfront. The evening will end back at the Inn where there are often social evenings and BBQs. This Friday Afternoon Bike Pub Crawl that starts at a historic Inn in downtown Bend, Oregon. From there we will do tastings at 2 different Brew Pubs, followed by a facility brewing ... moretour at a local brewery. There will also be a historic tour of the Old Mill District and the waterfront. The tour ends back at the Inn where there are often social evenings and BBQs. 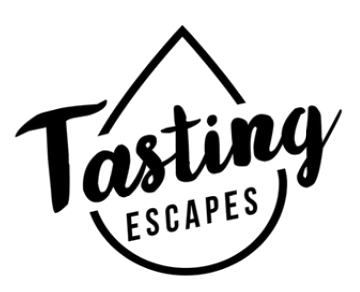 This is no ordinary wine tour! Your wine tour guide will be a WSET Certified Personal Sommelier who knows, loves and appreciates the wine country. Your guide will be with you all day, ... moreinside the tasting rooms and out in the vineyards, helping you understand more about your personal palate and the winemaking process. This is an intimate look at the wine country as our personal guest and how these wines compare to wines from around the world. This is truly a personal wine country experience, unlike others. We have been visiting the wine country for more than 20 years and each tour is curated based on quality, price, and expression of terroir. This is not your average wine tour! We are a "wine class on wheels" with transportation provided and not a limousine service that provides wine country transportation. We maintain a fleet of Honda Odyssey vans which seat six (and maybe seven) average size adults comfortably. Tours are also available to Columbia Valley Gorge (just East of Portland) as well as Urban Wineries! While the Willamette Valley specializes in Pinot Noir with rolling hills reminiscent of Burgundy, the Gorge features various Bordeaux red varietals and sweeping vistas of the Columbia River. Our philosophy is simple......we help you get personal about wine! Looking for a romantic and one-of-a-kind experience in the Willamette Valley for your next special occasion perhaps a birthday or an anniversary. Then this intimate three-hour hot ... moreair balloon adventure is just perfect for you! 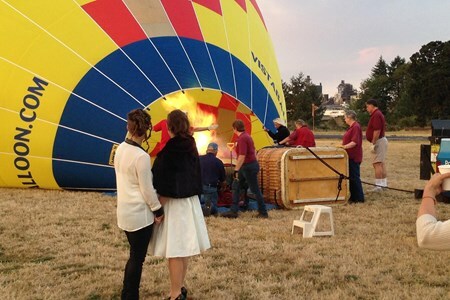 During your hot air balloon experience, you will get the opportunity to help to inflate the balloon, take a one hour flight over Willamette Valley followed by a romantic champagne brunch. 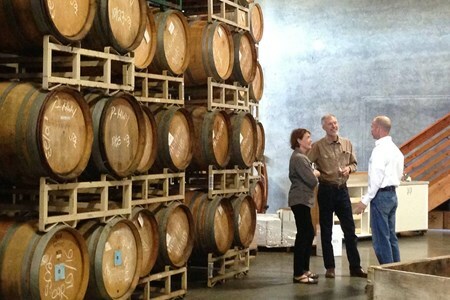 It's a great way to see (and taste) what makes the Willamette Valley so special. Your private wine tour will begin right after your hot air balloon experience with all transportation, tastings fees and a delicious lunch provided. You will be picked up from the launch location at the Newberg Sportsman Airpark. Thus, you only need to park once in the morning (or get a ride) and we take care of the rest since return transportation to most Portland-area locations after your wine tour is included. On this Speakeasy Tour of New York's trendy SoHo and NoHo areas, we will dive into all the historical developments that lead to Prohibition in the United States from 1920 to 1933. ... moreWe will tour 6 of the best speakeasies, secret taverns and famous bars of the SoHo and NoHo districts of Manhattan on this 2h 30-minute tour. Where you can try an award-winning high quality craft cocktail, while you sit back and enjoy all the history about why and how Prohibition started and as well how it was enforced. The tour will end close to Delancey Street and Essex Street where there are many bars, restaurants, nightlife and subway stations and the tour guide will be there for directions and recommendations. Nothing says Bend like outdoor experiences that last a lifetime. And nothing says adventure like hopping in your own private helicopter to go wine tasting at our premier vineyard, ... morea place where magic happens. Experience Central Oregon’s stunning snow-capped high mountain scenery at Faith, Hope and Charity Vineyards born from the visionaries, Roger and Cindy Grossmann. They have carefully created the beginnings of a 315-acre development, vineyard and guest ranch, in Terrebonne, Oregon nestled in a private 1,800 acre valley. As well as a beautiful 15 acre vineyard Faith, Hope and Charity Vineyards offers wines available for tasting in their newly remodeled tasting room and a wedding or event site that features master gardener landscaping. The views of Smith Rock and the Three Sisters Mountains are breathtaking. Their 15 acre vineyard is currently growing nine different hybrid grapes, LaCrescent, Vignoles, Marechal Foch, La Crosse, Frontenac Gris, Traminette, St. Croix, Leon Millot and Marquette. Central Oregon wine country’s smaller size and family wineries are as charming as they are beautiful, here you will find authentic wine tasting experiences without the crush of Napa. 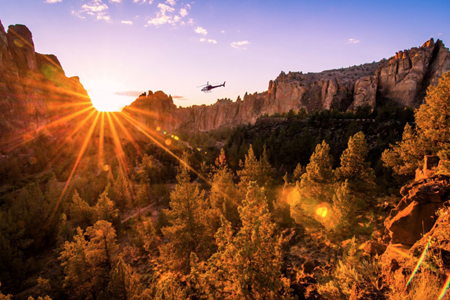 You and your guests will enjoy a leisurely scenic flight from the Bend airport or pickup at any of Bend’s luxury golf resorts across rolling fields and through Crooked River Gorge. We will land at a site overlooking acres of working farm grounds, canyons and ridges. The winery grounds are set before its namesake the “Three Sisters” Mountains, Faith, Hope and Charity. Take in the breathtaking views of Smith Rock and the Mountain range right from their tasting room. Your tour includes a charcuterie, artisan cheese and chocolate tasting board that you can enjoy outside with stunning mountain views. 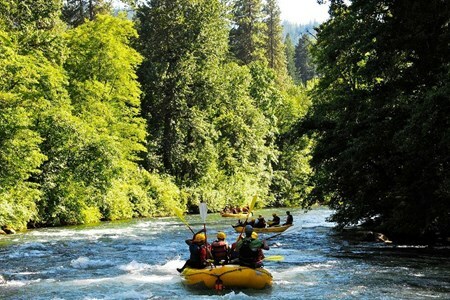 This tour can be combined with weddings in Bend, corporate events, bridesmaids adventures and much more. Bring your imagination and we’ll do the rest.